FloCEP has developed a state-of-the-art flow modelling facility for demonstrating how existing mineral processing systems are operating in real time and the effect when applying our technology. 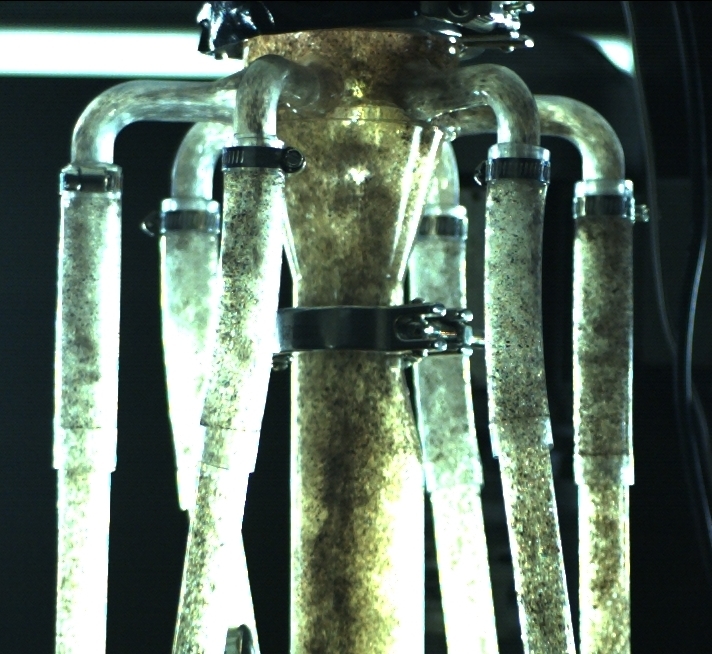 Using physical modelling based on transparent one-tenth scale models of various components and distributor systems created with a 3D printer, a flow loop circulates slurry. The slurry is introduced into the models at a velocity similar to that would be applied at full scale (up to 5 m/s), simulating plant conditions. Models of conventional components such as distributors, valves, cyclones, launders and pipe work are constructed from on-site measurements, drawings and scanned dimensions. The flow modelling test loop was designed and constructed to deliver a constant and controllable flow of slurry to the components under test conditions in order to eliminate any shortcutting of the carried solids through the recirculation equipment. This ensures that the nature of the solids and the solids content feeding the tested component remains consistent at any point in time. In the flow modelling videos below, both test loops are circulating the same slurry material at the exact same velocity rate. Twin high-speed video cameras with customised high-intensity lighting are installed around the transparent scaled distributor components. The cameras are synchronized so that images are matched frame by frame, with each camera capturing 32GB of data in 4 sec at 4000 frames/s (fps) or 8 sec at 2000 fps. The video is generally viewed at 20-30 frames per second. A typical project camera shoot generates 1 – 2 TB of data; an example of a still image captured from the video recordings is shown. The essential function of the scale model testing is visualisation. While the modelling has had some application in refining some features of the FloCEP flow distributor design, its major use has been in helping prospective clients gain a deeper appreciation of how the distributor works and what it achieves over existing infrastructure.